The attack uses a remarkably simple trick to part users with their digital funds. Cryptocurrency values are assigned to a long, unique string of characters known as a wallet. In order to make a transaction, a sender typically needs to enter the recipient’s wallet address in their app. This is similar to how you would put a real-world address on an envelope in order for it to be delivered to the correct location. Rather than manually enter these long and complicated addresses, however, most users will copy-and-paste them. This is where the clipper family of malware steps in. Once installed, the malware monitors the system’s clipboard. Once it detects something that looks like a target address, it changes it to an address operated by the malware’s controller. If the end user then submits the transaction without noticing the change, the attacker receives the currency instead. Clipper malware has been around since at least 2017 targeting Windows users. Android app variants emerged in the middle of last year, but were relegated to third-party app stores outside of Google’s walled garden. This latest finding snuck through Google’s defenses. It is a reminder that no matter the system, users should take charge of their own security. 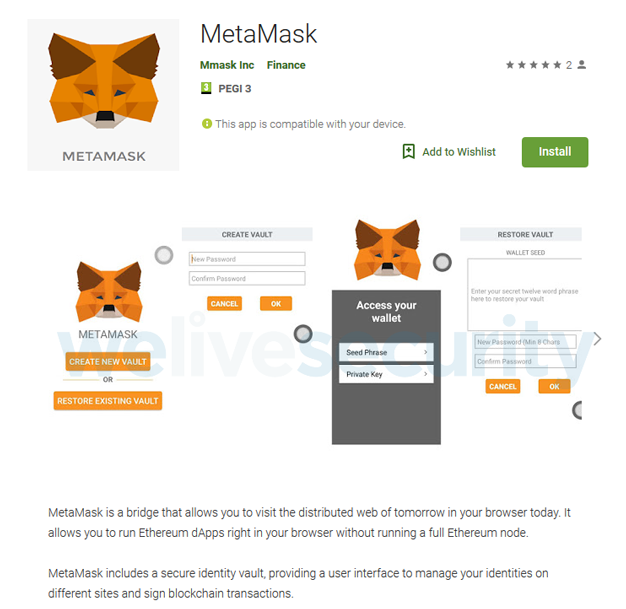 In this instance, MetaMask’s official website has no mention of mobile applications – only desktop browser extensions. Additionally, users should verify that all transaction information is correct before submitting. Users should also be cautious of using the clipboard to enter credentials, as the clipboard can be read by any running application. Lastly, it is always best to install the latest security updates. No single aspect is a silver bullet for security, but an diligent security posture can at least reduce the risk of becoming compromised.